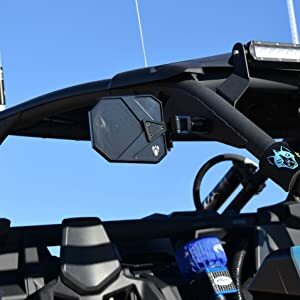 These stylish, 100% Aluminum side mirrors are the best value in the industry, that will look great on RZR's, YXZ's, Wildcats, and Side By Side's with 1.75" roll cages. 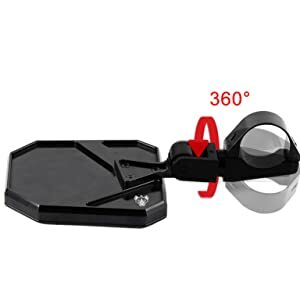 The 1200R convex mirror provides a great range of sight behind you, and the mount design has been optimized for a sleek look, while retaining a maximum field of vision. The anodized Black finish will hold up for years to the elements. The mirrors come with mounting instructions and a complete parts breakdown, and are 100% rebuildable. The clean, simple design allows for adjustability for all size drivers, and the break away design will move when striking trees and brush in a natural motion, preventing damage. Does NOT FIT Polaris Ranger XP 900, 1000, and 2015+ 570 models, Can Am Defender, Honda Pioneer, or the Polaris General. 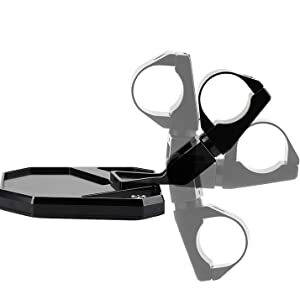 We have another Cuero Mirror with a X3 specific roll cage mount for those models. Cuero, Texas, is the home of the mythical Chupacabra. And the Cuero mirrors is that heart and soul of Performance Side By Side Enthusiasts - customers that want maximum value, nice accessories that are built to last. Two set screws firmly lock the Cuero into position once you've reached the adjustment you prefer. Mount the mirrors high or low, you can easily find a setting that works for you, with any cage, for any size driver. This exclusive design combines maximum adjustability and a "break away" angle that's ideal for real world riding conditions, and allow the mirror to fold in, without causing damage. The clamp is low profile on the front facing section, to accommodate as many windshields (BUT NOT ALL) as possible. We were able to achieve this with the sturdy rear section of the mounting bracket optimized for the adjustable, breakaway design. Top of the line quality is an amazing value, these mirrors look fantastic! The black anodized Aluminum with the laser etched logo will look great after years of abuse. Intense heat, mud, rocks, sand dunes, these are built to last. Some mirrors look cool, but they are tiny and aren't as useful as they should be, you're buying mirrors to see after all. The size of the Cuero works well for duners, rock crawlers, mud riders, and everyone in between. A slight convex shape to the all glass mirror adds a little more field of vision, without distorting the image.